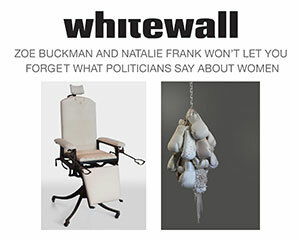 Katy Donoghue of Whitewall Magazine interviews feminist artists Zoë Buckman and Natalie Frank about their upcoming mural collaboration with NY Live Arts. The piece titled We Hold These Truths to be Self-Evident is a response to the “election” of Donald Trump. Text gathered from statements male politicians have made about women the last few years will be obscured by the image of a reclining woman along the 31 foot long wall.